Whole Number Algorithms and a Bit of Algebra! To look at addition, subtraction, multiplication and division of whole numbers from a geometric, "hands-on" perspective and an algorithmic perspective. This activity is intended for teachers. The activity is designed to make connections between the use of manipulatives and the development of algorithms. Parents and students are welcomed! Materials Needed - Virtual Manipulative Base 10 Blocks! Open the virtual Base 10 Blocks. Click on the place value mat icon to change the background, if you need. Click on the figures to get the units, tens, and hundreds pieces. Click on the hammer, glue, or lasso to help do your work! Part 1: Addition - Focus on trading and regrouping. Part 2: Subtraction - Focus on trading and regrouping. 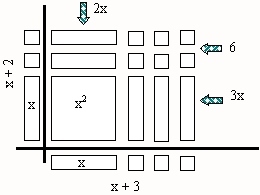 Part 3: Multiplication - Focus on the distributive property and area models. Part 4: Division - Focus on the scaffold method and area models. Part 5: A Bit of Algebra - Focus on the distributive property and area models. Try these problems using Base 10 Blocks and the algorithm. Document your work. One Type of Multiplication Algorithm - If you have 23 students in your class and they each need 12 straws for a craft project, how many straws do you need to supply? 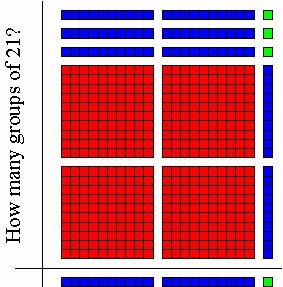 We write this as 23 groups of 12 or 23 × 12. Write out how you would find the solution to this problem. Notice two applications of the Distributive Property gives us the "standard" pieces. Here you see this in both vertical and horizontal formats. Find the pieces from the computations below on the area model. Notice that we are actually finding 12, 23's. One Type of Division Algorithm - You have 483 sea shells for a class art project. Each student needs 21 shells. How many students will be able to make the project? How many groups of 21 shells can you form out of 483 objects? We write 483 ÷ 21. Write out how you would find the solution to this problem. Find the number of groups of size 21 are on the Area Model. Draw in the left most column with the appropriate "Base 10 Blocks." Now, you have 483 sea shells for a class art project. There are 21 students in your class. If you give each student the same number of shells, how many shells will each student have? Use the blocks to model this problem. Is it still written 483 ÷ 21? Discuss. Try these by drawing Base 10 Blocks. Then, write out the solution using the scaffold method. Teacher Note: When you pick problems for illustration with Base 10 blocks, make sure you check them out first using the blocks! Sometimes a problem requires that you break up a FLAT in order to fill in the area model. This type of problem is not the best for a first use of the blocks. Part 5: Moving to Algebra! We can use the Base 10 blocks concept to create XY Blocks. X and Y are unknown lengths! Optional: Click here to make a set of XY Blocks. Use the Back button to return to this page. We will only need X Blocks for this activity. Look at the figure below. 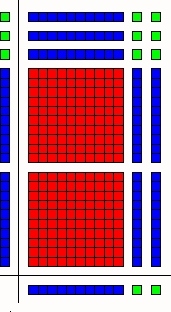 This is an area representation of (x + 2)( x + 3). Compare this to 23 ×12. Do you see a similarity? Find each term of (x + 2)(x + 3) on the picture above. Try these! Draw them out and then expand. Can you see the terms on your area model? Extension: Draw and expand (x + 2y + 3)(2x + y). Hint: You will need a y and y2 block.